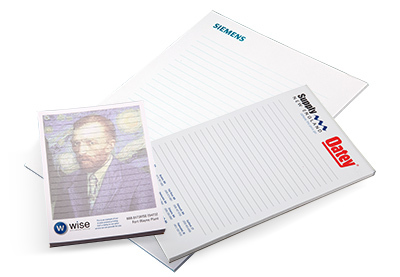 Wise custom notepads are a powerful promotional and branding tool. They’re perfect for customer giveaways, business notes and reminder lists. You’ll be delighted with these quality one-sided customized paper pads. Each pad is 25 or 50 sheets of super-bright paper with a glue-top binding and hard cardboard backing. Upload any image, graphic or photograph to make personalized memo pads. They are very efficient. Always respond in a timely manner. Easy to work with. Very Friendly and knowledgeable customer service reps.
Jean HardestyGraphic Business Systems, LLC.